The importance of Latin America and of understanding the region has never been greater. We encourage you to participate in our events and support our efforts to educate students and the public about Latin America. Private philanthropy is critical to the health and vitality of our program. 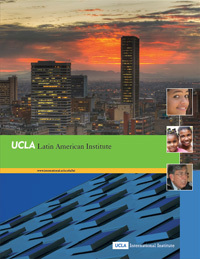 We welcome contributions to the Latin American Institute and its member centers and programs. There are many ways to give, including outright gifts, pledges payable over time, and permanent endowments. Gifts of any size are welcome. All gifts are tax deductible and may be directed to the area of greatest interest to you.